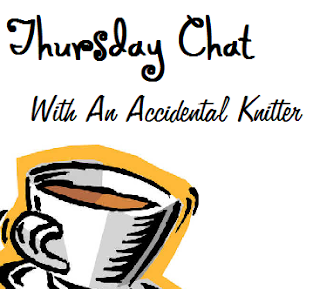 This week, I had the pleasure of interviewing Natalie from Misadventures in Craft. Here is how we got on! What got you into knitting? "It was a bit of a whim really! I was in Edinburgh while my boyfriend was at a conference. It started to rain so shopping became less fun and I decided to head back to the hotel until he got back. 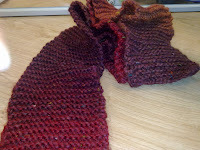 I stumbled across a 'how to knit this scarf' kit and decided that would kill some time! I made the scarf, which I don't actually like, and decided that this was something I could really get in to. 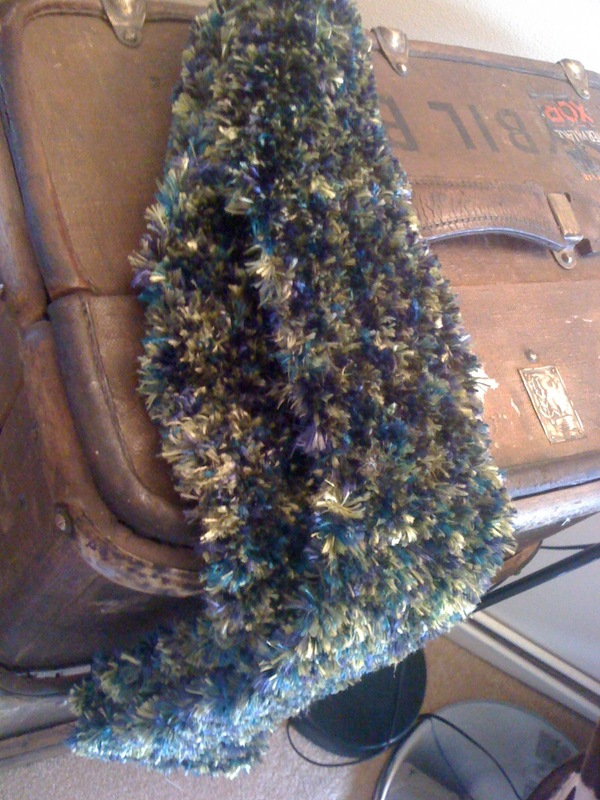 One of the reasons I carried on was so that I could knit a Christmas present for my Mum. I always make things for people's presents, and used to make a food hamper with handmade chutneys, truffles, all sorts of things, that my parents looked forward to all year. After my Dad passed away, it wasn't the same and Mum didn't want to be opening the same type of present that they used to have. But I couldn't not make something, so I knitted instead!" What is your favourite item to knit? "Hmmm, interesting question... I haven't been knitting long enough to have favourites yet I don't think! started less than a year ago, and haven't made many of the same types of things (you can see my finished item list here). I loved making my first pair of socks, I am working on my second pair and have yarn for at least 4 pairs waiting in my stash, so I may have to say socks! I have so many more plans, and so many patterns to try out (I mean, I haven't even knitted a hat yet!) so I have plenty of time to start developing favourites"
Is there anything you've sworn never to knit again? "Well, I keep cursing my Clapotis but that probably has more to do with the fact that I'm knitting it on a deadline than anything else! 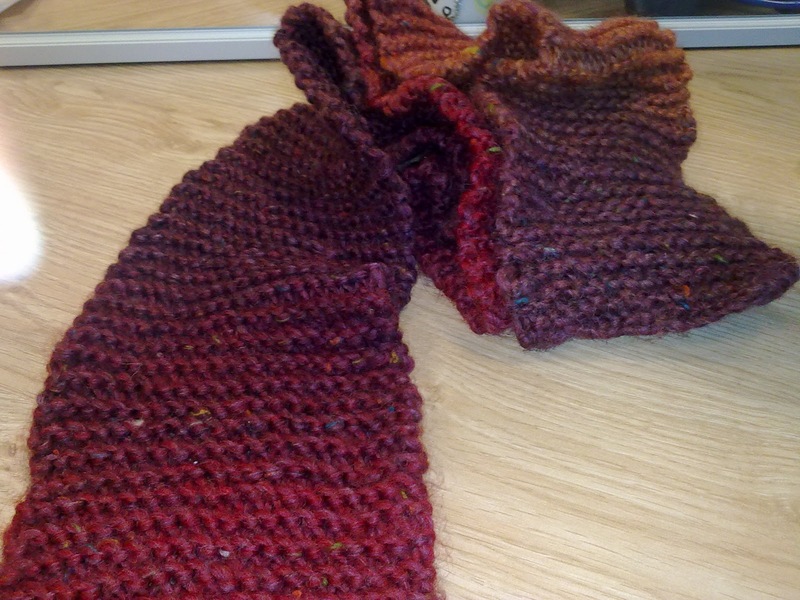 The scarf I made for my Mum was the second thing I cast on, and I didn't have any experience of different yarns or anything like that, so I picked up something that I thought looked lovely in the ball. The colours were great, it felt nice and soft... it just so happened to be eyelash yarn. Yeah, never again! It took forever, was very unpleasant to knit with and I didn't enjoy it one bit. On the plus side, it was very forgiving - the yarn covers up all of the twisted stitches, unintentional yarn overs and variations in gauge! So, anything in eyelash yarn is in my 'never again' list." Is there any item you'd love to be able to knit, but currently can't? "I don't know if I'd say can't (at infant school I was always told 'there's no such thing as can't, you just haven't tried hard enough yet!') but I'm not good at lace. At all! I tried making a Wisp, which went badly wrong, and I'm not patient enough to do it all properly. 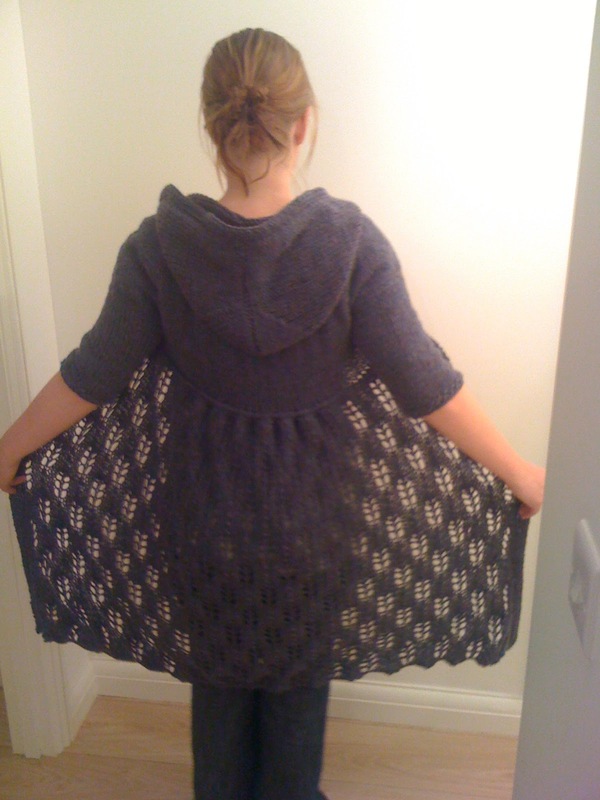 Having said that, the bottom of my hooded cardigan is fir cone lace, which worked out well (with only one rogue yarn over!) but that was in Aran (worsted) weight, I'm not up to trying teeny lace on teeny needles with teeny thin yarn again just yet!" Ever attempted crochet? If so, how did you get on? "I haven't, although I'm sure I should at least get some of the basics down - lots of patterns seem to call for crochet edging. I do have one hook - which is currently exclusively used for picking up dropped stitches!" How would you sum up your blog in two words? Who is your favourite blogger, and why? "I don't know if I can answer that! There are loads of blogs that I read and enjoy, for many different reasons, so I don't know if I could pick just one. I do like Ysolda's blog, her post about what's included in Little Red in the City made me buy the book! I never really got into reading the Yarn Harlot blog (shhh! ), but that's probably because I like lots of pictures to go with the words usually." We all have a post we are particularly proud of, which is yours and why? "Oooooh, good question! I really like re-reading my archives (wow, that makes me sound conceited doesn't it!) and there are quite a few posts that I particularly like, for different reasons. The day 5 post for Knitting and Crochet Blog Week (2011) was a big success, the title of the topic was 'And Now For Something Completely Different' with the aim of blogging in a different way to normal. My post was simply a selection of images that I represent me; some photos that I've taken, some that boyfriend had taken and some random images that said what I wanted them to say. I really enjoyed putting the post together, and it is my second highest viewed page ever. My highest viewed post, is surprisingly a sewing project rather than a knitting one, my little notions bag. And my highest ever commented post (I really do love comments!) 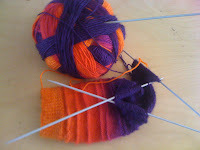 was a work in progress Wednesday, and I'm sure it was the colour of my sock yarn that got everyone talking!" "I've always loved to write, and have made up stories in my head for as long as I can remember. I started my blog because I live over 2 hours away from my Mum and wanted to keep her up to date with what I was making! Some days I'm inspired by what I'm working on, other days it's by what I've bought/done recently and sometimes I just have a bunch of thoughts in my head to get down on paper. Boyfriend always encourages me to write and was so pleased when I started a blog because it meant I'd be writing regularly. I've written 2 children's stories, for his kids, and I also have ideas for 2 novels stored in my head - but then, doesn't everybody?!" There are other time periodss that I'd love to see too (not sure about living in any of them though) but I think it depends on which social class I could be in. Lower social classes had a pretty rough time throughout history, and women didn't fare particularly well. We have things pretty good now, in terms of our rights and freedoms, so I think I'm better off where I am now!" Well, I hope you enjoyed the interview with Natalie, because I certainly did! (and I'm sure like me you're very jealous of all those wonderful trips to Egypt!) Don't forget to visit her blog, and don't forget to come back next Thursday, for your weekly interview fix! It's funny reading my words on a different blog! Very interesting. I'm jealous of the trips to Egypt too. I've always wanted to go. What a lovely little chat! Thanks for sharing! I didn't realise you were a relatively new knitter Natalie, I only found your blog during the blog week. You've done well to have a garment made, I haven't made myself anything yet!